We were totally in the same boat of what things will look like in 10 years during our bathroom remodel. We ended up with special order wood looking tile on the floor g they now carry it at all big box stores). We were also worried about too much accent tile, so we ended up with a classic subway tile plus a ‘modern mosaic border’ that could be changed back to subway or some other accent (sort of like young house loves master bath luck). Since it was such a small accent we carried it to the mirror we made to help tie things in nicely. Hope it helps with some ideas. A far as your talented mood boards, I’m loving the second one. It has a very classic modern vibe that doesn’t seem too ‘trendy.’ I think the vanity is perfect for the manly vibe. Could be just me but maybe the mosaic and herring bone clash a bit (although I’ve been known to worry about too many textures). The possibilities are endless. And oops didn’t see that you picked up the faux wood tile I was taking about. We love ours except the black we chose shows every fuzzy that falls from the towel to the ground. Small cleaning price to pay for what we love. Ohhhhh that is GOOD to hear….there aren’t a whole lot of positive reviews for the faux wood tile. BUT everyone who is reviewing doesn’t have them! So they are just talking about something they don’t have any real experience with, they just think it’s slippery. We love the look, but the reviews got us nervous. Glad to hear they are just as awesome as we thought they would be! ha. I commented on your other post about bringing in navy before reading this one. Obviously I fell in love with Option Numero Uno. And I fell hard. There’s nothing about it I don’t like. I think the neutrals are more “balanced” throughout the room than #2. Btw, I have that mosaic tile from #2 in my kitchen but in all black. Everything you guys pick is gorgeous and you’ll make it work. I have no doubt about that! I once saw a floor to ceiling fireplace covered in the all black mosaic tile….it was jaw dropping beautiful! I love the drama. 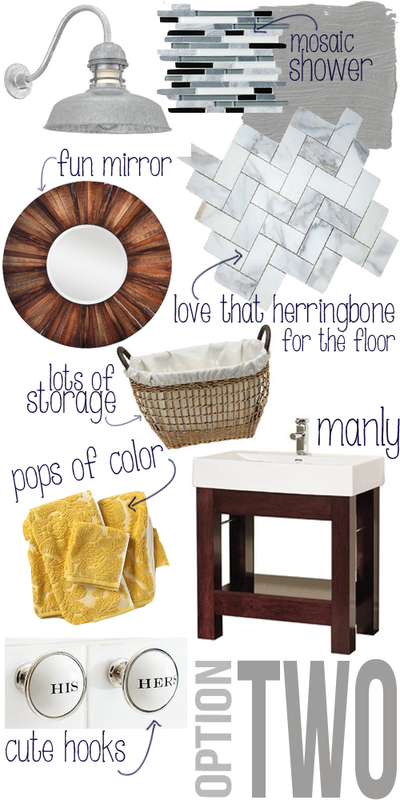 I am leaning hard towards option one because I love the wood so much….but I like the vanity better in number two….it’s just too much. My brain hurts haha! Ohhhh I can’t even begin to think about the kitchen haha! It needs a major overhaul, but I am terrified of all the decision making haha!!!! Maybe we should take donations and do our bathrooms together! I am afraid that two dark tones would look like they are trying to be brothers, but end up wonky cousins. But staining….now there is an idea! 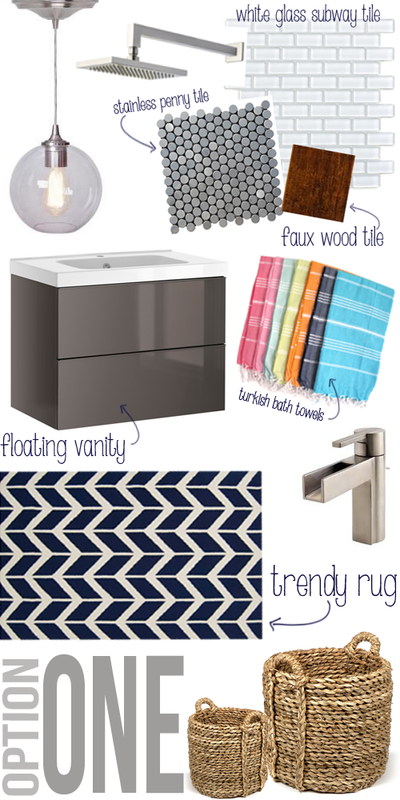 I do love a good furniture renovation…and I know there are lots of tutorials on taking “not your typical bathroom vanity” and throwing a sink on it. Could cut costs too. This is why I love you all!!!! So many ideas…. Heck yes I can, I realized this morning that I didn’t include any links! What a terrible blogger!!! I love option two. Herringbone much cooler and longer lasting for future for floor as well as that choice in tiles.